It’s Lipreading Awareness Week 2017! It has happened to us all, that moment when we have misheard a word, missed what someone has said, or just completely lipread them wrong. We want to know when has lipreading gone wrong for you? What words have caused confusion?! Communication professionals, perhaps someone has misheard you, or been mistaken when you have given instruction. 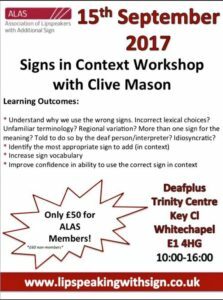 Tweet us your funny stories for a chance to win one free place at our Signs in Context workshop taking place Friday 15th September 2017. Competition closes 14/09/17 at 18:00 and the winner will be notified on Twitter at 19:00.